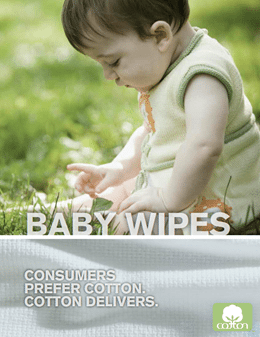 Build a stronger business with cotton in baby wipes. Consumers believe natural fibers to be extremely safe for the environment. surpassing perceptions of rayon and other petroleum-based synthetics. Wipes need to be STRONG. Wipes need to be ABSORBENT. Wipes need to trap DIRT. Wipes need to be SOFT. Focus group: Mother of Multiples, blind sample, qualitative evaluation. ISO 9073-3 (measured in machine direction). Strength reported in Newtons. AMERICA’S COTTON PRODUCERS AND IMPORTERS. Service Marks/Trademarks of Cotton Incorporated. © 2013 Cotton Incorporated. Census statistics, online survey. Issues & Answers Baby Wipes Consumer Study (2012). Are familiar with the Seal of Cotton trademark. package means there is cotton inside. consumers are most likely to say HIGH QUALITY and HIGH VALUE.